Are deacons allowed to wear their tonia outside of church? How do you know they were doing it for donations? If you look at his blog, the organizing deacon specifically said he does not do it for any money. He only does it as missionary work. He has other videos and missionary stories about how he only wants to talk and poll people's belief in God. In the first couple of seconds, you see an orange thing (bag?) on the ground, then later you see a lady putting money in it. People don't usually lay money on the ground, right? No. Deacons serve in the church itself. Unless these are all full deacons or arch-deacons they should not be wearing their tounias outside the church. We don't wear tounias while doing tasbeha do we? The lady was picking up the paper so she can follow along. I hope that Coptic youth, servants, and even priests would learn from these efforts done by our brothers and sisters the Catholics in proclaiming the Gospel to the public. I agree. I get so much criticism for how I expose people to Orthodoxy, but you know what, I do a good job. This, while well intentioned, did very little. I agree but you know what would have been better? If they explained it before hands. Some people are so found of singing and praising to God. They would come to church just for the praises. I know some one who comes to a coptic church every Saturday for the midnight praises without it he wouldnot come to church at all. So I assure you it is not in vain. Copticandproud, that makes even less sense. People are walking by, you cannot explain it to those walking by, then expect the next hundred passersby to know what is going on. When I was young(er) and (more) foolish I brought up a similar idea to some friends of mine. I thought it would be a good idea to pray tasbeha outdoors at the promenade. It never happened, thank God. I look back and realize how silly it was. I did not want to share Christ with people, but the awesome praises our church has to offer. I would not have been praying to God, but putting on a performance for pedestrians. Man.. they should have done the kiyahk tune!!! WHy on earth are they doing sanawee tune? What kind of permission(s) does one need to do this in the street like that? Do you need to ask the Mayor or the police for permission? Did you also notice that they even collected money for it. I think these deacons should make a CD. I'm very much impressed. This is an amazing idea. I fail to see what's wrong with it. 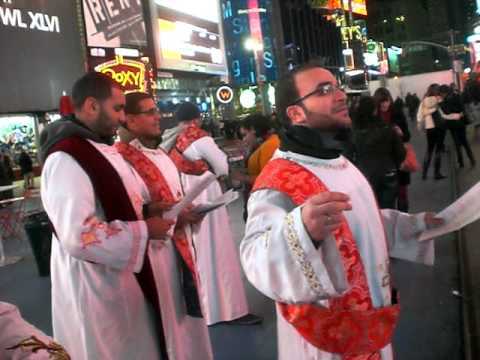 Caroling during Christmas times is traditional in North America and these guys are putting a Coptic spin to it, singing a beautiful hymn easy to understand for non-Copts. Anyone passing by will clearly hear the hymn is about the birth of Jesus Christ. This gives exposure to our Church and functions as missionary by catching people's attention quickly with their deacon garbs. @Biboboy, I can't see putting together a congregation that big in Dundas square or Times Square where the only participants would be Copts anyways and would do little missionary work. Guys, give them a break. It's the Christmas season. People sing carols in the street all the time. It's a culturally acceptable form of preaching that is specific to this season. If you did it any other time, people will call the police. If you sing tasbeha in a promenade, you will become an offense, not a blessing. Secondly, different people respond to the gospel differently. Some come to a church by word of mouth, some come because they are looking for God and find Him in the most unusual places. We shouldn't worry about who is or isn't receiving the message. Additionally, why is a bad thing to take money? When Christ commissioned His disciples to preach, He didn't forbid his disciples from taking food and money. "And remain in the same house, eating and drinking such things as they give, for the laborer is worthy of his wages." Luke 10:7. The laborer is worthy of His wages. These Coptic deacons obviously didn't go preaching as a get rich scheme. The money was peripheral. It was most likely not their intention to preach for money but regardless we don't know how they will use this money. It might be used for more missionary work or it may be given to the poor. and they weren't taking money (read the earlier posts). hers the link for all the pictures. How about when they do stupid skits on YouTube? I guess that is permissable, because they are doing something with a purpose. Oh, there I go again, pontificating! I think that pontificating was directed at me. If it was, then no. Stupid skits on YouTube = not ok if they (1) offend, (2) speak blasphemy, (3) have ulterior motives. stupid skits on youtube have no purpose because its not something SERIOUS ... like geting someone to be christian... stupid skits have no purpose they are made for those people to have fun. and thats it. I was talking about the people who do skits on YouTube and use the tonias as "costumes & props"; not to mention opening the altar curtain and using the altar table as a prop. I'm not commenting on this clip. I was following-up to the comment about "using tonias". Although, I would like to hear SupermanBAM's take on the body language, since he is psychologically inclined. Why is everyone yelling at me? I get it, she was picking up a piece of paper. I didn't know. Sorry. If my blood-related-Uncle, ILSM, agrees with me, then I'm never wrong. He's a church father. Hey everyone, these people did a good job. My brother knows them and they are a group who do lots of missionary work in New York. They did not do this for a youtube video or for money. Furthermore, they also spoke to the people as well. They did not just pray. They preached to the people and they received much positive response. This is also one of many of their missionary efforts. One of them is a doctor, who, once he became a doctor, gave up his work six months later to serve in this missionary work for the rest of his life. I love it and I think it's great. As we met up to pray in Time Square for ways that God can use us to reach His children, we began to feel a little bit nervous. Are we making fools of ourselves? Right around the time that we thought that, a dashing 300 pound hairy, middle aged dude, walked by us in a wonder woman costume! Though this wasn't that abnormal for New York City, we felt that God had sent us that guy to give us a specific message. There are people out there who are not ashamed of making fools of themselves, for no real goal or purpose at all. Are we willing to look a little weird so we can give glory to the God we love? As the U2 line goes "The right to appear ridiculous is something I hold dear." With that in mind, we finished up praying and stood right in the heart of Time Square, in front of the huge TKTS stairs, and put on our Tunics. People around us were already figuring that something is up. What are these 6 idiots doing? They look pretty young and normal, but why are they putting on those weird outfits? We had song books printed out for people to sing along if they wished. The books had a nice compilation of Christmas carols and Christmas Hymns. As we began to sing (though we are not the most musically gifted bunch) we saw that many who were passing by were smiling and encouraging us. Many began to take pictures and videos and a number of people stood by to hear the hymns. After every two songs or so, we would share the message of love and salvation with the crowd. We'd explain to them the symbolism of our vestments and how we can all put on a new, white, spotless robe no matter what we've done in the past! The surprising thing again was that people were listening and really were receptive! Some of the people were seekers and some were believers. Some just had some pointers for our singing :) "Man, you guys need some practice!" said one young guy who approached us on the side. "You're singing some alto and some soprano." (blank stare from half of us who had no clue what either of those meant). One man approached us after a short sermon we gave and said "We love Jesus too. We spent 7 years in Bulgaria living as missionaries and what you guys are doing is amazing. Keep being bold for Christ!" Other Orthodox Christians saw us and were excited to know that our Orthodox Church has a deep love for mission and evangelism! "You guys are Orthodox?! Me too! I thought those tunics looked familiar!" One bright young man came by looking pretty curious. "you guys Orthodox?" we said, "Yup." Still curious "Coptic?" "Yup." No he was really interested. With a serious face he asked in Arabic "Ok, is there a liturgy here?" He wanted to make sure he wasn't missing anything. We spent half of our night at Time Square and the other half at Rockefeller. 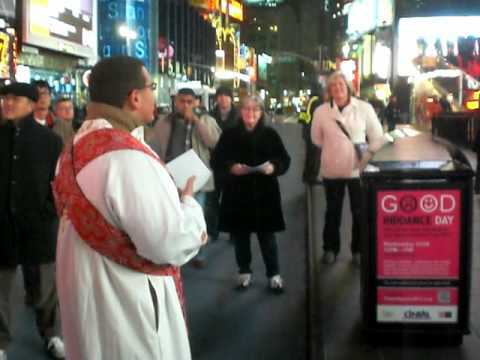 God spoke to many people that night and when we got to Rockefeller center, we stood by two guys who were ringing a little bell and collecting money for the homeless of NYC. "God sent you guys to us tonight man. We were getting discouraged and thinking that we weren't going to raise any money tonight. Can you come again tomorrow?" He's doing great work every night. Jesus said "My Father is always working" and we're here to be about our Father's business. i think their really great to ... i feel like they are doing a great job ... fromm all of us in the tasbeha.org cummunity tell them to keep up the great work .! !